In connection with the massive introduction of nanocrystalline and nanocomposite materials in which elastic deformation can reach more than 3%into engineering practice, arises the need for the formulation of nonlinear elastic equations and the basic criteria for fracture mechanics. 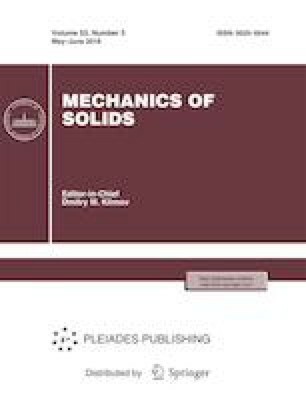 Current coefficient of transverse deformation [1, 2, 3] is used in this article and nonlinear elastic equations and a modified Griffith strength criterion  for a cracked specimen are formulated. On the basis of this criterion, the values of theoretical and real strength are estimated. Three cases are considered: an ideal lattice without defects, nanocrystalline and nanocomposite materials with crack sizes within a few nanometers, a laboratory sample with a micron size of cracks. It is shown that the theoretical strength is two orders of magnitude greater than the strength of the laboratory sample. This result is in agreement with the known estimates in the literature . In the case when the material has cracks of the order of nanosizes, there is a significant reduction in strength (within one order of magnitude of theoretical strength). Original Russian Text © A.R. Arutyunyan, R.A. Arutyunyan, 2018, published in Izvestiya Akademii Nauk, Mekhanika Tverdogo Tela, 2018, No. 3, pp. 129–134.